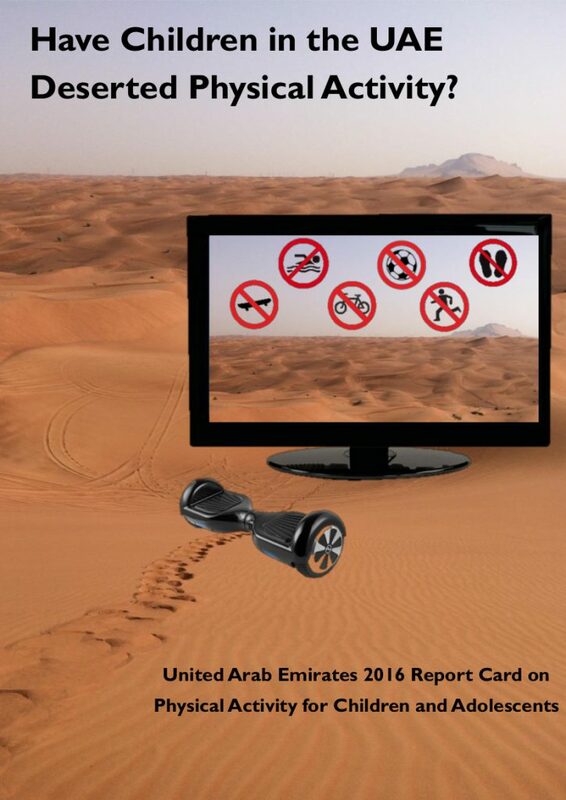 Access physical activity grades, report cards and other related documents from all Global Matrix events in which United Arab Emirates has participated. School physical education curriculums should focus on developing physical literacy and individual lessons should maximise the time spent in moderate-to-vigorous intensity physical activity (minimum of 150 min/wk) whilst offering fun, enjoyable, and skill developing activities for both boys and girls. Educational authorities should facilitate schools to provide a wider variety of physical activity-based extracurricular clubs and organised sports teams that participate in inter-emirate leagues and competitions. Environmental agencies and municipalities should continue to (i) develop and maintain accessible green and active spaces for all children and adults to interact socially; and (ii) re-develop transport infrastructures (e.g. safe walking and cycling path networks) within communities, districts, and cities to promote active transport across the lifespan. Tom Loney, Ph.D.Tom Loney is an Assistant Professor in Public Health and Epidemiology in the Institute of Public Health, College of Medicine and Health Sciences at the United Arab Emirates (UAE) University in the desert oasis city of Al Ain. He completed his PhD under the supervision of Professor Martyn Standage and Professor Dylan Thompson at the University of Bath (United Kingdom) where his doctoral research focussed on the epidemiology of physical activity and non-communicable disease. Dr Loney moved to the UAE in 2008 and his current research focusses on measurement issues related to the assessment of physical activity and sedentary behaviour, population surveillance of physical activity and non-communicable diseases, and interventions to increase physical activity in school children, adults, and older adults. 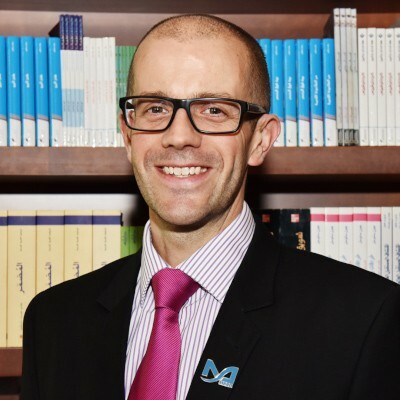 Dr Loney’s recent research projects include exploring the association between physical activity and psychosocial health in female expatriate domestic workers in the UAE and also the relationship between physical activity, acculturation, and cardiovascular health in male South Asian migrant workers in the UAE. He is the lead physical activity researcher on the Abu Dhabi Cohort study and this project will provide accelerometer-derived estimates of free-living physical activity for 20,000 Emirati adults in the emirate of Abu Dhabi, UAE. "Participating in the Active Health Kids Global Alliance 3.0 initiative has been extremely rewarding. It has provided the UAE with a unique opportunity to be part of a global network of physical activity researchers from 49 different countries. Through our research and shared experiences, the global mission is to increase physical activity levels across all domains in children and their families. Let’s stand up together and start moving!" - Tom Loney, Ph.D.
Marilia Silva Paulo1, Javaid Nauman1,2, Abdishakur Abdulle3, Abdulla Aljunaibi4, Mouza Alzaabi1, Caroline Barakat-Haddad5, Mohamud Sheek-Hussein1, Syed Mahboob Shah1, Susan Yousufzai5, and Tom Loney6. 2K.G. Jebsen Center of Exercise in Medicine at the Department of Circulation and Medical Imaging, Faculty of Medicine and Health Sciences, Norwegian University of Science and Technology, Trondheim, Norway. 3Public Health Research Center, New York University Abu Dhabi, Abu Dhabi, United Arab Emirates. 4Department of Pediatrics, Zayed Military Hospital, Abu Dhabi, United Arab Emirates. 5Faculty of Health Sciences, University of Ontario Institute of Technology, Ontario, Canada. 6College of Medicine, Mohammed Bin Rashid University of Medicine and Health Sciences, Dubai, United Arab Emirates. Loney (tom.loney@mbru.ac.ae) is the corresponding author. Keywords: adolescent, environment design, motor activity, sedentary lifestyle, social environment, youth sports. Background: The United Arab Emirates (UAE) 2018 Report Card provides a systematic evaluation of how the UAE is performing in supporting and engaging physical activity (PA) in children and adolescents. Methods: The 2018 Report Card included 10 core PA indicators that were common to the Global Matrix 3.0 (Table 1). Grades were based on the best available evidence using the proportion of children and youth achieving a defined benchmark: A+=94%-100%; A=87%-93%; A-=80-86%; B+=74%-79%; B=67%-73%; B-=60%-66%; C+=54%-59%; C=47%-53%; C-=40%-46%; D+=34%-39%; D=27%-33%; D-=20% - 26%; F=<20%; INC= Incomplete (insufficient or inadequate information to assign a grade). Results: Grades for each indicator are presented in Table 1. Overall PA levels remain low and sedentary behaviours remain high amongst UAE children. Only 16% of UAE children achieved the recommended amount of moderate-to-vigorous PA (i.e. ≥60 min/d) and this has fallen from 20% in 2005. Expatriate children and boys had higher levels of PA compared to Emirati children and girls, respectively; however, PA levels declined from early to late adolescence in all groups. Less than half of children achieved the screen time recommendations (i.e. ≤2 h/d) and this declined with age, especially amongst girls. Only 25% of children participated in physical education classes on ≥3 d/wk (~150 min/wk). The UAE Government has invested significant funds and resources into developing and implementing strategies and facilities that will increase PA across the entire population. Conclusions: The majority of UAE children are not achieving the daily recommendations for PA or screen time. Findings highlight the dire need for action-based research that can lead to evidence-informed public health strategies that have the capacity to increase PA for children, adolescents, and adults. Sustained nationwide school- and community-based culturally-appropriate interventions are required to improve PA at a population level. Further development of active transport networks, walkable environments, and active spaces may help to increase PA across the entire UAE population. Urban planners should continue to re-develop transport infrastructures within communities, districts, and cities to promote active transport across the lifespan. "Producing the United Arab Emirates inaugural Report Card on Physical Activity in Children has been a challenging but ultimately rewarding journey. 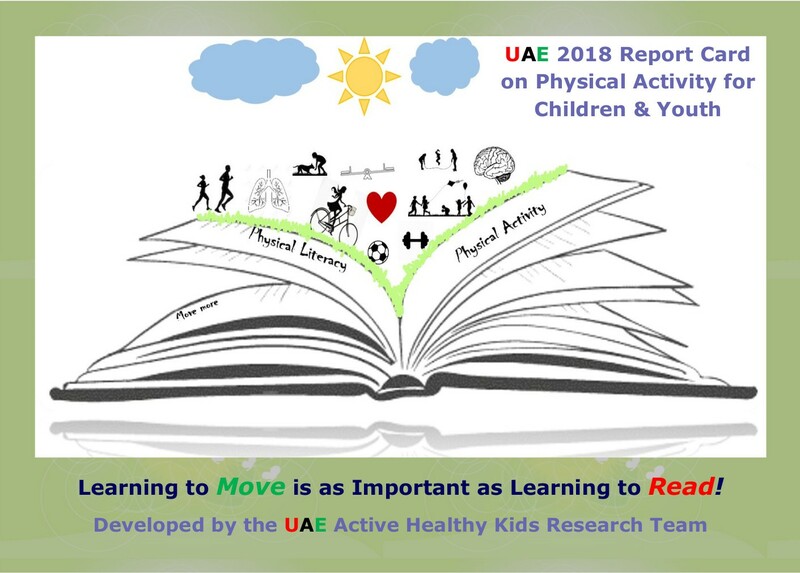 We hope that the first UAE Report Card will raise awareness of the national physical activity trends and be used as the foundations of evidence-based interventions and policies aimed at increasing physical activity in both children and adults. The next step is to facilitate action to ensure that the entire UAE population, from early life to late adulthood, becomes more physically active on a daily basis." - Tom Loney, Ph.D.
Background: The Active Healthy Kids 2016 United Arab Emirates (UAE) Report Card provides a systematic evaluation of how the UAE is performing in supporting and engaging physical activity (PA) in children and adolescents. Methods: The Active Healthy Kids Global Alliance framework and standardized set of procedures were used to perform the systematic assessment of PA in UAE youth and children. Indicator grades were based on the proportion of children and youth achieving a defined benchmark: A=81%-100%; B=61%-80%; C=41%-60%; D=21%-40%; F=0%-20%; INC=Incomplete Data. Results: Overall Physical Activity Level and Active Transportation both received a grade of D-/F-. Sedentary Behavior and Family and Peers both received a C- minus grade and School was graded D. Minus grades indicate PA disparities related to age, gender, nationality, socioeconomic status, and geographic location. Government Strategies and Investments received a B+ grade. Sport Participation, Active Play, and Community and the Built Environment were graded INC due to a lack of nationally representative data for all seven emirates. Conclusions: The majority of UAE children are not achieving the daily recommended level of PA. The UAE leadership has invested significant resources into improving PA through school- and community-based PA interventions; however, inter- and intra-emirate population-based strategies remain fragmented.